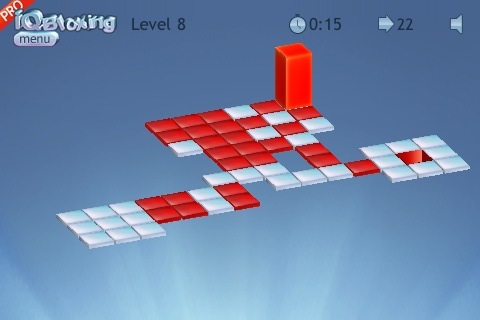 iQBloxing PRO is a stimulating 3D spatial logic puzzle. You’ve probably seen this type of game before. I actually remember playing a game just like it back in elementary school. Bloxorz! The concept is easy, you have a rectangular block on a floating floor. Your job is to get the block from where it is into the square hole on the other end. You move your block by swiping in the direction you want it go. You don’t have to swipe on the block itself and you can flip it in any which way across the floor. The entire block must stay on the floor panels because laying it halfway over the edge will make it topple over and you will have to start from the beginning. There are a several obstacles and complications you will have to get past, like teleport panels and switches or floor panels that require the even weight distribution of the block and cannot support the entire weight of a block standing vertically. There are 41 levels and each level has its own goals you can shoot for. In addition to the accomplishment of solving the level, finishing the level within a certain number of moves and amount of time will garner you a placement of Gold, Silver or Bronze. There are also general achievements you can get which are listed under the “Hall of Fame.” iQBloxing also has Twitter and Facebook integration so you can share your accomplishments with everyone you know. iQBloxing’s design is simple but quite polished. While the gameplay may seem simple, the novelty of the game lies in being able to ‘strategize’ and solve the puzzle. iQBloxing does this well without needing to throw in any flashy fluff. Puzzles are engaging and you’ll have a heck of a time figuring out how to get that block into the hole. The only issue with iQBloxing is that even though Bees4Honey credits Bloxorz as their inspiration, some of the levels are exact copies of those in Bloxorz and while that familiarity might make one wax nostalgic, it still unfortunately raises some questions of the ripping-off sort. At any rate, iQBloxing (or Bloxors) is definitely a solid exercise in spatial reasoning. iQBloxing PRO is priced at $0.99, although iQBloxing (no PRO) is free to download and play. The free version contains less levels but also gives you an in-app option of purchasing the extra levels for the same price as iQBloxing PRO, so if these kinds of puzzles appeal to you, check this game out. Sample the lite version of iQBloxing PRO on your iPhone for free. AppSafari review of iQBloxing PRO was written by Aucoeur Ngo on March 29th, 2010 and categorized under App Store, Fun, Games, Puzzler. Page viewed 3429 times, 1 so far today. Need help on using these apps? Please read the Help Page.